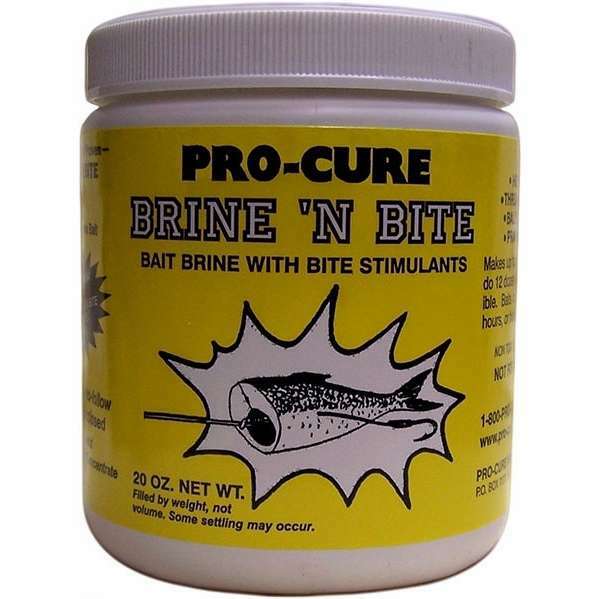 Pro-Cure Brine-N-Brite toughens your baits, but unlike rock salt it infuses your baits with powerful amino acids that magnify the smell and flavor of your baits and trigger an impulse in a fish's brain to feed. It tightens your baits scales, and helps keep baits fresh longer. 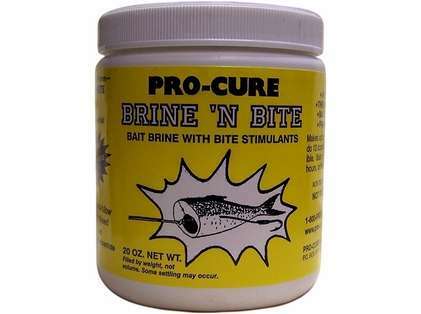 Many guides have realized with brine n bite you can save your baits and fish them over the next few days. Brine n Bite is completely compatible with all of the Bad Azz Bait Dyes. Initially used as a brine, many guide are now sprinkling it onto their baits dry. The salts and amino acids marinate in just fine, but you get a much tougher bait than the brine method. This is critical when fishing anchovies or sardines, as they are usually much softer than a herring. If you are trolling in heavy currents or tide rips, or trolling really fast, and you need a super tough herring, try the dry method. You will be impressed. magic solution to make my clam stiffer. it make better solid than sea salt. also it help to not spoil..